The Golden Egg is part of the Hunting Ground trails in the Dominguez/Escalante National Conservation Area near Grand Junction, Colorado. The trail is labeled as 080A on the BLM DENCA travel map. It begins off of Jack's trail, DENCA 080, where it descends to a bench that it makes a big loop around before climbing back up to the ridge and reconnecting with DENCA 080 about 3 tenths of a mile from where it began. The names that we have applied to the trails in the Hunting Ground area are ones that we dreamed up before the BLM had finished their study and assigned them all numbers. To get to the area drive about 4.5 miles south of Whitewater on Highway 50 and turn right onto the Bean Ranch Road. Follow the Bean Ranch Road over the hill. The pavement ends after 1.3 miles and the boundary to the Dominguez-Escalante National Conservation Area comes up after another half mile. The large parking area to the right of the cattleguard serves as the trailhead. There are a variety of ways to get to one of the two starting points for the Golden Egg (80A). The most direct approach is to climb the Beanstalk (82) and either go to the right to the north end of the Golden Egg or go to the left to the south end. Both ends begin and end off of Jack's Trail (80). For this post we are starting on the south end. Note that the trails in the Hunting Ground are going through a transformation as the BLM continues to develop the area and the modes of trail use have changed from the anything goes that was practiced in the past to explicit designations for each trail. With everyone adhering to the new management plan the Hunting Ground has the potential to become another Grand Junction treasure. The first couple hundred feet of the trail is a bit steep as it leaves the rim and drops down to the bench. As you look out you can pretty much see most of the route the trail takes as it travels around the bench. From the first overlook you can see all the way up the Gunnison River to the Bridgeport trailhead that provides access to Dominguez Canyon. As the trail continues around the bench there are several more overlooks that have some nice views both up and down the rivers corridor. The terrain is a lot more uneven as the trail finishes looping around the bench and heading back up to the rim as it dips in and out of several washes. The north side of the loop is rougher getting up the hill but it isn't quite as steep and the rim is about 75 feet lower in elevation at this point. We come out here and do a 10 mile trail run every so often where we follow the Bean Ranch Road to the Giant's Trail (92A), to (92), to (80), and on up to the south end of the Golden Egg which we follow around the bench and back up to (80) and then down the Beanstalk to the trailhead, adding in the Englishman to get the extra distance we need. All the uphill climbing makes for a really nice workout. In the past we have mountain biked, dirt biked, hiked and ran all these trails. In our opinion all the trails here coupled with the miles and miles of other trails in the valley and on the Grand Mesa and elsewhere help to make a good case for designating the area around Grand Junction as the 'Trail Running Capitol of the World'. 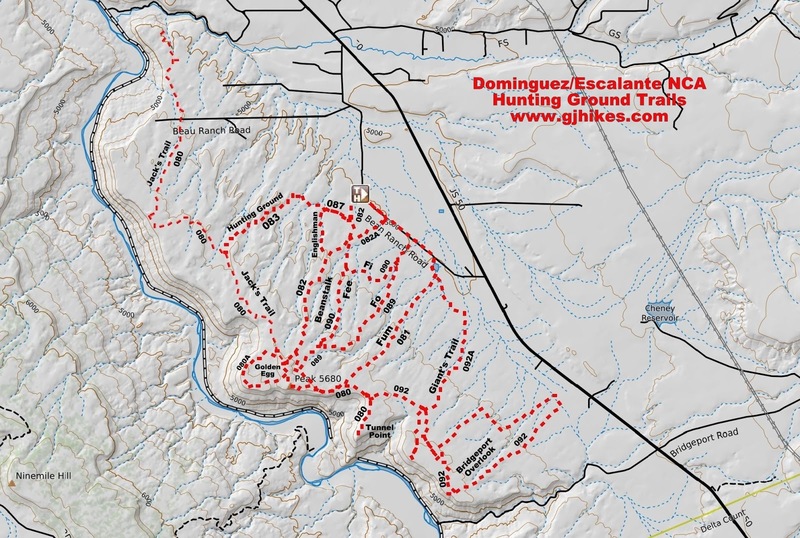 However you like your trails the Golden Egg trail in the Hunting Ground Area of the Dominguez/Escalante National Conservation Area is a worthwhile option to consider. If you would like to see it for yourself then all you have to do is 'Take a hike'.